Mr. Mickey and I are proud to be on the steering committee to elect Lisa Niddifer Rice as Criminal Court Judge. Last evening we attended a meet and greet fundraiser at the law offices of one our dearest friends, Tony Seaton. Isn't this a great banner? I wore black pants from Chico's with a three-quarter sleeve jacket from Dillard's in red with black buttons over a black tank. The sandals are from T.J.Maxx. 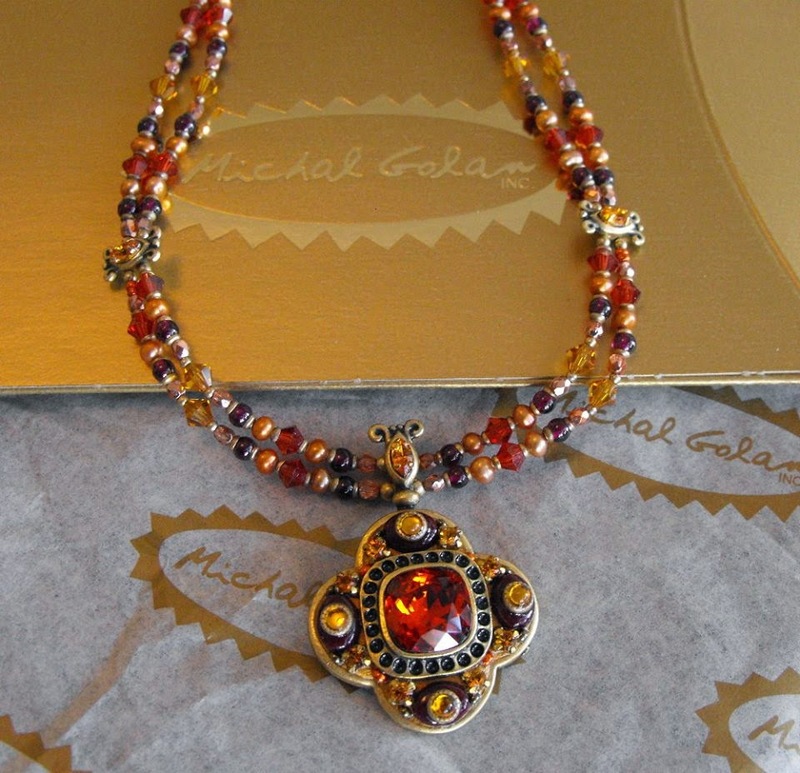 You may recall seeing the beautiful jewelry from Michal Golan that I have shared with you on previous posts. I am happy to offer you this special discount for Mother's Day. 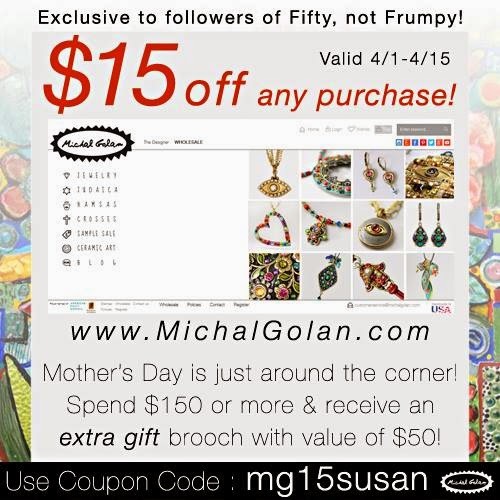 Visit her site here Michal Golan and enter the code above to get $15 off your purchase. Mr. Mickey bought these fabulous earrings for me several years ago. Below is the gorgeous necklace Michal sent to me after she saw the earrings above featured in one of my earlier posts. I was thrilled to add this one to my collection! One of our favorite annual fundraisers to attend is the 4x4 sponsored by the Johnson City Area Arts Council. The event was held at the beautiful Carnegie Hotel in Johnson City. I was so happy to see my friend Lisa Nidiffer Rice whose campaign for Criminal Court Judge I am proud to be working on. When you purchase a ticket for this event you receive a four inch by four inch masterpiece created by a local artist. (Thus the name 4x4.) As you sign in for the evening and get your name tag on a ribbon, you also draw a number which corresponds to one of the masterpieces. If you would like to trade your masterpiece for another one, you are given a tiny battery powered light to attach to your tag which tells everyone you are willing to trade your masterpiece for theirs. It encourages many conversations! In keeping with the 60's British Invasion theme for the evening, local music legends Lynda Laws and Jason Lloyd, also known as Ivy Road, performed music from that era. My sweet friend Elanor Bacon Crouch planned and executed the theme and decorations for the event and Sharon Squibb is one of our talented local artists whose work can be seen to the left between Elanor and I.
I am wearing one of the jackets and the evening sandals I found at my recent Dillard's winter clearance haul. The jacket is a vivid green with hematite gray buttons. Since it is still rather cool in the evenings here, I wore a thin black V-neck tee under the jacket and my old faithful Chico's travelers pants. Wearing the tee with the sleeves pushed up for the event allowed me not to have carry or keep up with a wrap for the evening. We celebrated eight wonderful happy years of dating by staying at the Martha Washington Inn for the weekend. Mr. Mickey promptly picked me up on Friday afternoon for the drive up to Abingdon, Virginia. My travel attire was a red simple comfort top from Covered Perfectly under a cropped red on red Ruby Rd. jeweled sweater from Dillard's last year. The jeans are from Chico's last fall and DVF shoes are from Nordstrom last year. Later in the evening after we dressed for dinner, we took a few photos in the foyer of the beautiful hotel. I wore a black lace front Traveler's sweater jacket over a black tank top and black crepe evening slacks all from Chico's. I found the T-strap black leather and suede high heels at T.J.Maxx last year. The Kenneth Cole Reaction bag is also from T.J.Maxx. Each table in the restaurant had a finial or some sort of what-not (as my grandmother used to call them). This one was on our table so I teased Mr. Mickey that he had won The People's Choice Award. Here he is giving his acceptance speech. Thankfully there were very few people dining at this late hour so we didn't disturb anyone with our shenanigans. During our stay at the hotel, we met two amazing sixty-year-old women whom we visited with on several occasions during the weekend. That's Audrey above. She is the President of a building supply company and has also served as the only female President of their national trade organization. Mr. Mickey and I were both captivated by her bubbly personality and boundless energy. We had breakfast with Audrey and her handsome husband, Allen on Saturday. They both were so delightful and interesting! We hope to spend many more happy hours in their company. Below is Katie. She was a music teacher before she retired. Here she is singing "When I Fall In Love" to us at our table. She should be on the Voice or America's Got Talent. She has a perfectly beautiful voice and a wonderful outgoing personality to go along with it. You already know Mr. Mickey loves to share an occasional bread pudding after dinner. This one is banana bread and it was so good. During the day on Saturday, we spent some time shopping and reading in the library as well as attempting to play a game of checkers. I was too sleepy to be much of a challenge so we ended up reading until we both started to fall asleep in front of the fire. We ended the afternoon by having a couple's massage in the SPA. I wore a metallic cardigan sweater over my shoulders. The long necklace is made with matte beads in both silver and gold and can easily be converted to a shorter necklace. The black knit top has a high-low hem and I wore it with khaki zipper ankle pants. All items are from Chico's. The block heel sandals were found at T.J.Maxx last week. After we dressed for dinner at Rain Restaurant in downtown Abingdon we snapped a few more pictures in the lobby. On Saturday night I wore a cobalt blue silk Peter Nygard jacket from Dillard's with the same tank, pants and shoes I wore the night before. Traveling light means packing things that can be worn in different combinations. This is one of the great jackets I bought at Dillard's awesome sale a couple of weeks ago. There is a park on the grounds of the hotel so I couldn't resist sitting in the warm sunshine while the valet attendant was going for our car. We had dinner with friends on this spring like Sunday evening. It was wonderful to be able to wear only a light weight navy linen jacket from Appleseed's with a white tank top and khaki zip ankle pants from Chico's. The sunglasses are by Kenneth Cole Reaction from T.J. Maxx. I found the Anne Klein Sport sandals at T.J.Maxx last week for $34.99. The same shoes are also offered here for $68.95! That's why I love to shop at T.J.Maxx at the beginning of the season. The bag is by Coach from their outlet in Blowing Rock, North Carolina. Eight years ago on this day Mr. Mickey and I went on our first date. That date changed my life forever in all the most positive ways. On our anniversary evening, we shared a wonderful dinner at one of our favorite restaurants, Wellington's at The Carnegie Hotel. For this special evening, I wore a black Simple Comfort tunic from Covered Perfectly with brocade pants and a long color block collarless jacket from Chico's. (Both Chico's items are on their clearance racks now.) The shoes are from Nordstrom last fall. 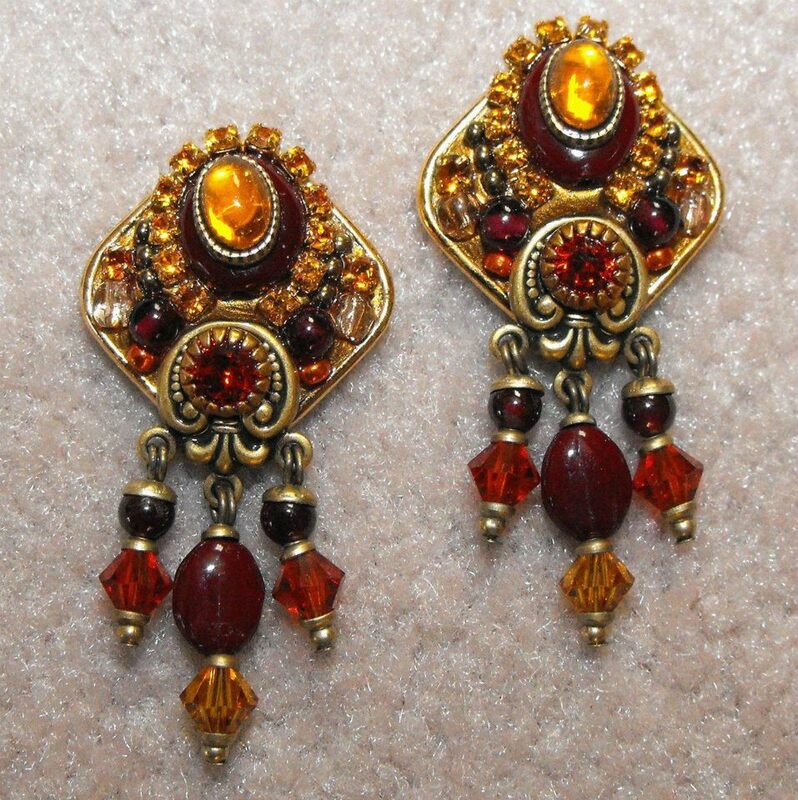 Mr. Mickey bought these gorgeous earrings for me a few years ago in a boutique in North Carolina. They are by Michal Golan. A few days ago Michal contacted me via the blog, much to my delight. She has been one of my favorite designers for many years. This week I received this fabulous necklace to go with my treasured earrings. I am so grateful to Michal for this generous gift. Imagine my surprise when the hostess showed us to our usual private booth and there were eight perfect roses (for eight perfect years) and a very special card already there waiting for us! We celebrated with a bottle of 2004 Château Peyredon Lagravette Listrac-Médoc. We asked the wine steward to put it in a decanter. Of course, no special dinner for us is complete without a lovely dessert. We shared this chocolate one since chocolate and red wine go so well together. I hope that you have enjoyed this mini tour of my home and a glimpse of the celebration of our anniversary. The sun came out and the weather was beautiful on this Saturday. That means it was a perfect day to go shopping! With temperatures in the fifties, a blazer, and a scarf was all we needed for outerwear. We stopped at the North Carolina rest stop on the way to Asheville just to enjoy the sunshine and the majestic view of the mountains. Carmel's in the Grove Arcade is one of our favorite places to stop for an early afternoon treat of their yummy spicy pimento cheese. A yearly ritual for us includes going to the annual clearance sales at Dillard's in the Asheville Mall. We stopped by the men's store where I tried on this fun men's hat. I didn't buy it but it sure was cute! This is a happy woman! There was a three-day sale which included 40% off their already reduced prices. I bought three pairs of shoes, a white blouse, and four jackets. The total was less than $220! One of the things I love to do in any city is to drive through the older neighborhoods to look at the houses. Biltmore Forest is a village outside of Asheville which was built on land from part of the original Biltmore estate. We watched this house being built a few years ago and it remains one of our favorites. Looking up from one of the well-manicured holes of the golf course you can just see the top portion of this fabulous home. This is another newer home. My guess is that wing to the left houses an indoor swimming pool. Have you ever seen a more artistic mailbox? Before dinner, we stopped to visit the Blue Spiral Gallery to see my friend Coralie Tweed's collection of beautiful paintings. We had a wonderful dinner at our favorite vegetarian restaurant in town, The Laughing Seed Cafe. This is carrot cake done the vegetarian way. It was awesome! Today I wore a fuchsia V-neck long sleeve tee which I found on sale at T.J.Maxx earlier in the week. The darker fuchsia scarf is from Target. The blue blazer is old. The Platinum straight leg jeans are from Chico's. The boots are old from Stein Mart. The bag is by Michael Kors via T.J.Maxx. My moisturizer and almost all of the makeup I am wearing is from Merle Norman Cosmetics. Lip gloss is Plush Plum Colour Riche Balm L’Oréal Paris. Thank you for reading my blog and for joining me on this fun journey through midlife and beyond.